Earthquake Strikes Central Italy, Jr.
Rescuers are searching for survivors after a 6.2 quake struck several small towns and villages. 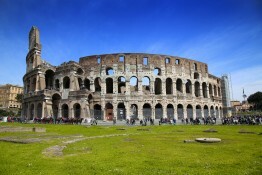 A look at the Eternal City and one of its most famous landmarks: The Roman Colosseum. Sailing through the Mediterranean, it’s easy to get distracted by the pristine, calm waters – the bluest I’ve ever seen….